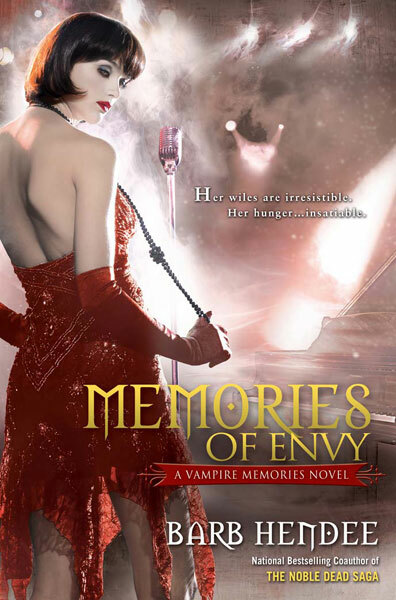 Barb Hendee posted the cover for Memories of Envy, the third book in her Vampire Memories series. Just love the chanteuse look that is going on here. The book releases October 5. A reluctant predator, Eleisha Clevon has made home for herself and other vampires like her in Portland. And, in spite of the risks, she is determined to locate all vampires still existing in isolation, so she might offer them sanctuary — and more importantly, so she can teach them to feed without killing. To Eleisha's shock, she learns that a lost vampire may be living as close as Denver, Colorado... but she has to approach this one more carefully than ever before. Simone Stratford is a beautiful, delicate-looking creature from the roaring twenties who enjoys playing elaborate games with mortals, stoking their passion for her before finally draining them of their blood. When Eleisha and her protector, Philip Branté, go to Denver in search of Simone, what they find is far worse — and more seductive — than either one bargained for. Philip’s love for Eleisha and his ability to fit into her world are pushed to the breaking point, as is Eleisha’s fierce belief in her own mission. I hadn't heard of this series but will go check it out - it sounds interesting and I really like the cover. Thanks for posting! Patti I like this cover a lot. Read the first and the 2nd book is in my TBR stack.